Books being bound require thoughtful designing and state-of-the-art production capabilities. Which is why our books are bound using multiple high-speed case makers. We have the capability of supplying books targeted toward children. 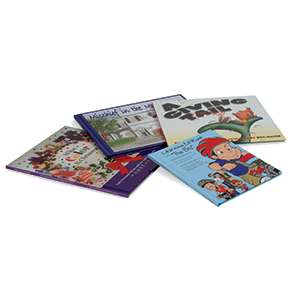 These books feature brilliantly colored pages targeted to attract and keep the attention of small children. Our thin books used for other purposes also feature high quality pages and superb binding. One of the important steps to creating a successful book is deciding on the right binding. We use either adhesives or Smyth sewn technology to bind our books. You can choose the method of binding depending on the target audience and your budget. Smyth sewn binding is durable. It is flexible as it allows the book to lay flat without tearing or toppling over. Adhesive binding is the process of binding the pages using an adhesive. It is a budget friendly alternative. The juvenile or thin books feature square backs .This helps us accommodate most designs and provides reading comfort. The cases can be manufactured in 1-16 page signatures. Our manufacturers have the capability of producing 6,000 books per hour. This enables us to take on orders of all magnitudes. Ad Industries provides exceptional services and helps you create books that are a delight for children as well as adults. To place an order or request more information, please contact Ad Industries at 818-765-4200 / 800-233-4201 or email at sales@adind.com.